James Holden is an idealistic ex-military officer on a mining ship who stumbles across a dangerous mystery when investigating a derelict ship drifting in space. Detective Miller is a cynical and corrupt policeman stationed on an asteroid colony who is hired to look for a missing young woman and finds himself increasingly determined to find out the cause of her disappearance. When both the abandoned ship and Miller’s case turn out to be connected Holden and Miller both find themselves dealing with dangerous secrets that could threaten the entire solar system. The book is a collaboration between Daniel Abraham and debut author Ty Franks, I wouldn't have said it was obvious that it was written by two authors and their writing does seem fairly consistent throughout. Abraham has been one of the best new fantasy authors of recent years (his “Long Price” series being particularly good) and it’s to Franks’ credit that his chapters are comparable in quality to those written by his more experienced co-author. The quality of the writing is good throughout, and I thought the pacing was good as well. It doesn't take long for the plot to become interesting and it does a good job of increasing the amount that is at stake in successive increments, starting from what appears to be a simple act of piracy and ending with the future of humanity at stake. It does also tell a complete story, even if there is plenty of potential for plots for the later books in the series. I thought the characterisation was also good, although the two main point-of-view characters get a lot more character development than the rest of the cast. The alternating point-of-views worked well, particularly in showing the different ways in which Holden and Miller deal with crises and it was particularly interesting to see how one main character appeared from the perspective of the other. Miller’s abrupt way of dealing with problems provides some of the book’s most memorable moments. 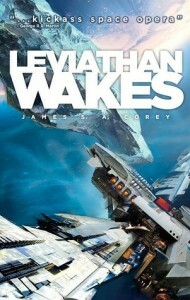 I liked the setting as well, most space opera stories seem to span several star systems but in Leviathan Wakes humanity is confined to the solar system due to the lack of faster-the-light travel. I thought it was a fairly plausible-sounding portrayal of how humanity would colonise the solar system, although in some places it could have done with a bit more detail (we never really hear much about what motivates the Earth or Martian governments even though it has quite a bit of relevance for the plot, but maybe we will in later books). It does a good job of conveying the claustrophobia and the perilousness of life on an asteroid colony. It does have a slightly old-fashioned feel to it and couldn’t really be said to be at the cutting-edge of Science Fiction writing, but there’s nothing wrong with a good, traditional Space Opera. Overall, I thought this was a very good Science Fiction novel, particularly considering it is the first novel for one of the co-authors.